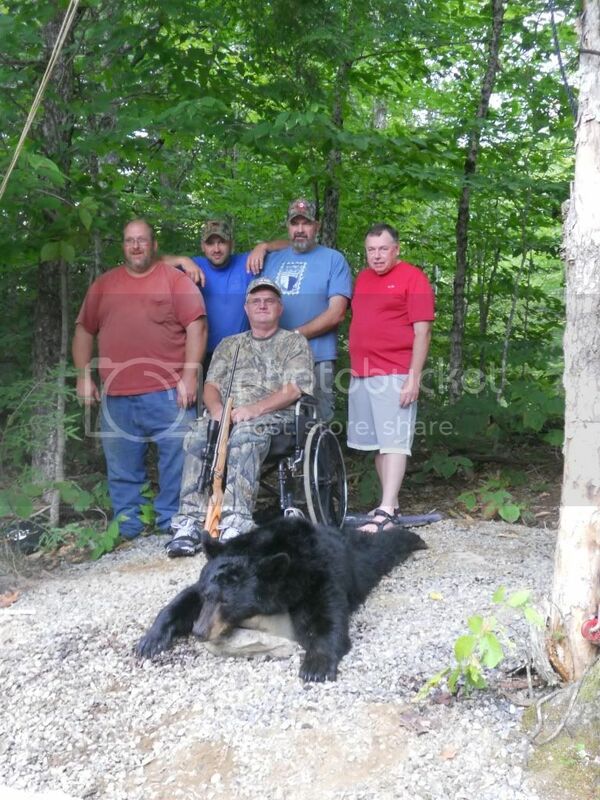 My Maine Bear taken 8-30-2012 with a lot of help from my friends. Here is the story! My friends and I left PA at 7:30pm Saturday for the long drive to Maine..we arrived at camp at 9:30 Sunday morning. The outfitter was all pumped up about the spot he had picked out for me,he had trail camera pictures of a BIG 3 legged bear pounding the bait I was going to hunt over,I was excited about this bear also..he was different than all of the others. After shooting the guns,excellent food we all hit the sack waiting for the Monday afternoon hunt. Day 1 Jay the outfitter drove be to my blind around 3:00pm and he had things all set up for me,he stopped the truck,unloaded my push chair and after pushing the chair 5 feet I was in my blind!!!!! Talk about service. I hunted until dark and all I saw was a pine martin and a few birds. Day 2,same thing nothing but birds. Day 3,same as day 2... After I had no luck after day 1, Jay started a new bait site in a different area of his 12,000 acre lease. On the ride back to camp he told me about the new area I would be hunting Thursday. I shot the bear with my Remington Model Seven, 140gr. Nosler Partitions, top off with my Zeiss Conquest 4.5-14-44mm. Big congrats! Thanks for sharing the story. I'm really wanting to get a bear. Congrats on the bear, she is a beaut! Very nice bear, shiny coat. Sounds like a great outfitter as well. Looks like you run with a rough crowd. Lol. Nice bear! Great time in the woods. Glad you can overcome with the pre-planning and help of friends. Woohoooo. Congrats to you. Looks like a great bear. That bear had been living well! The hide will make a great rug. Nice rifle combo. You can't beat a 7 with some Partitions. Congrats on a dandy bear!